Lyrics or Music: Which One First? In my rather lengthy period of blogging absence I’ve noticed quite a trend amongst the twittersphere. In 140 characters, always the same question, repeated like a broken record. When you feel the sudden bolt of creativity, what should you reach for? Your right hand itches for the pen, but your left longs for the guitar. Which one? I’ll tell you: Both. When you feel that raw pulp of creativity welling up, you’ve got to start singing what you’re thinking. If you play an instrument, strum some chords together and sing over it. If you release all those inhibitions, you’ll start finding lyrics and melodies that you wouldn’t be able to dream of if you worked through it one by one: working through both at the same time gives a song an incredible unity of elements that you can’t recapture when you separate them. This is why I devoted an entire post to the Ernest Hemingway quote: “The First Draft Of Everthing is S**t”. The more you just let go, the more you stop censoring your work, the more good stuff you’ll get out of those spurts of creativity. It’s an elegant irony: The more you allow yourself to be s**t, the better you’ll be. I can understand the appeal of “Lyrics Or Music”: it seems to provide a clear structure: first one, then the other. But separating the elements can do a great deal of harm to your songwriting, so what kind of structure can we place instead? Think about a wheat harvest. You’ve got two stages of production (I assume: bear with me, readers, I ain’t no farmer). First, the combine harvester goes around and gathers all the wheat it can. No stalk is left untouched. You get a lot of chaff, but you get a fair bit of wheat as well. Let’s call it the harvest stage. In the second stage, the farmers go around and pick all the wheat out of the chaff. The chaff gets thrown away, and the wheat gets stored. It’s a slow process, but it’s very deliberate and pre-meditated. Let’s call it the refinement stage. You can apply the same logic to your songwriting. First, harvest. The sun may only shine on your creativity for half an hour a week, but you’ve got to gather all the material you can from that. 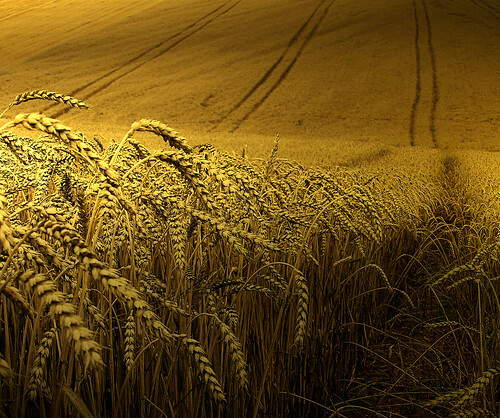 Write down the chords, record voice memos of the melodies: do whatever you can to remember them, because this is where the best wheat comes from. Don’t get me wrong, you’ll write a lot of s**t, but this where the second part comes in. Second, refinement. Take the wheat from the chaff. In between the creativity is where all the good work gets done. I mentioned Bruce Springsteen’s Car analogy in a separate post, but I’ll return to it again: If three cars aren’t working, you take all the parts that work and stick them in a new car, then bolt ’em all up and get it on the road. If you write 3 terrible songs, I bet you that there’s enough good bits to get one song really revving hard. Thing is: songs are far more malleable than cars. Take a chorus from one and turn it into a bridge. Take a strong lyric and slap it onto a strong melody. You’ll have to tweak the lyrics, but the new combinations of verses and chorus’s will throw up delicious new themes and ideas. You really can’t go wrong. The car analogy goes further: remember that 10-minute stream of consciousness piece you wrote about your ex-girlfriend? (read: beat-up 1970 Austin Maxi) Strip it for parts and move on. Start thinking of your songbook as a junkyard rather than a showroom. Don’t be afraid to go in there with a sledgehammer. The Lyrics or Music debate really needs silencing. Don’t waste your creativity noodling away on meaningless melodies, or stressing over stale poetry. Dive upon your instrument of choice and play.